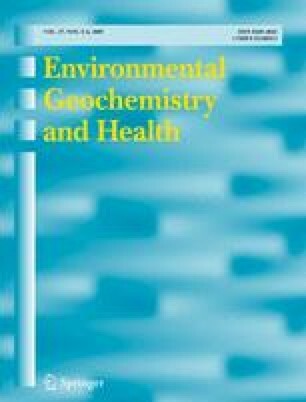 The distribution and enrichment of selected trace metals (Cd, Cr, Cu, Ni, Pb, Sn, Zn) in benthic sediments of the Southport Broadwater, a semi-enclosed coastal body of water adjacent to the Gold Coast city, south-eastern Queensland, Australia, was studied with the objective of assessing the extent and degree of sediment contamination. Sediment samples from the 0–10 cm and 10–20 cm depth intervals of 32 sites within the Southport Broadwater and surrounding residential canals were analysed for particle size distribution, pH, organic C and ‘near-total’ major (Al, Ca, Fe, Mn) and trace (Cd, Cr, Cu, Ni, Pb, Sn, Zn) metal contents. Sediment contamination for each trace metal was assessed by (1) comparison with Australian sediment quality guidelines, (2) calculation of the index of geoaccumulation based on regional background values, and (3) geochemical normalisation against Al (i.e. the abundance of alumino-silicate clay minerals). Based on this approach, the results indicate that submerged sediments in the study area are not presently enriched with Cd, Cr or Ni, with the spatial distribution of these metals being very well explained by the abundance of alumino-silicate clay minerals. However, several sites were strongly enriched with Cu, Pb, Sn and Zn, arising from sources related to either urban runoff or vessel maintenance activities. The study indicates that several varying approaches are needed for a satisfactory assessment of contaminant enrichment in estuarine sediments.